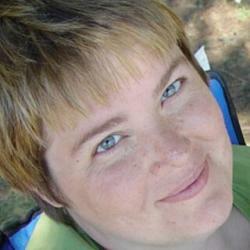 Originally published on Two Rivers blog on January 18, 2010. I spend a lot of time designing fairly complicated web applications. Many of these are enterprise level applications—not usually the kind of applications that are visible to the public. These applications are massive data entry, data reporting, and data manipulation applications. And they often have hundreds or even thousands of screens. As you can imagine, we spend a lot of time designing the navigation systems for these applications. After I heard Peter talk I asked myself: IS there an example of Searching in application navigation? And I remembered: Apple uses it on the Help menu of every application on their desktop platform. 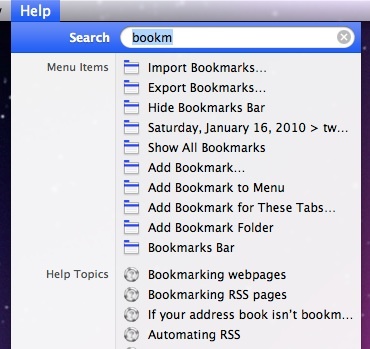 In this example, I’ve opened the Help menu in Safari and typed “bookm”. The first group of items I see is Menu Items that contain that text. Then there’s a list of Help Topics on the same. If I move the mouse down to highlight “Export Bookmarks,” then it actually shows me where the menu item can be found by opening the menu, highlighting the command, and putting a little moving arrow next to it. I actually use this a lot in more complicated applications and it works really well IF I know the name of the command I’m looking for. If I had searched for “Favorites,” I wouldn’t have seen anything. Similarly, if I had misspelled it as “Bokmarks” I would have been out of luck. There’s no stemming, synonyms, or anything fancy about this search—if you want something beyond what’s actually in the menu, you’re out of luck (actually, that’s where the Help Topics pick up—they catch a lot of those items in there). I can see by the “Related Searches” that I’m not the only person doing this. 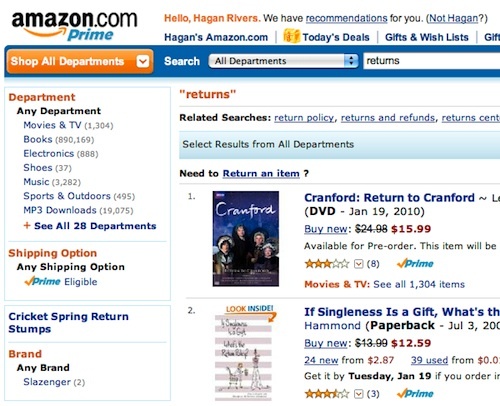 I see “return policy” “returns and refunds”, and “returns center” are all Related Searches. Looking at that again, now, I see that they have a little link that says “Need to Return an Item”. So they have application navigation searching too (it’s a little to subtle for me). When I gave my own UIE Virtual Seminar last year on Navigation, I got a question from one of the attendees. He said that it was a requirement at his company that the user be able to get to any screen in the product (and there were 1,000+) with no more than 2 clicks. Let me say that I think this is a pretty bogus requirement and probably has no basis whatsoever in actual usability of the product… But that aside, I enjoyed the challenge of thinking about how I’d do it. At the time, I was imagining a massive Site Map of the application, but now I think that perhaps another way to satisfy that requirement would be to implement the kind of searching that Apple has. Published here on February 22, 2010. Hagan developed this talent in her years of serving some of the biggest enterprise applications, in a bundle of industries. She’s worked in everything from finance to molecular science, from manufacturing to social networks. Clients like DST Systems, DemandWare, Partners Healthcare, and Inteq, just to name a few.